Are you looking for a firm large enough to be knowledgeable in all areas of accounting and taxes, but small enough to know you on a personal level? 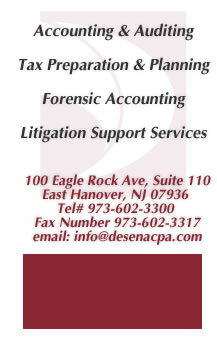 Then look no further than DeSena & Company Certified Public Accountants and Consultants. 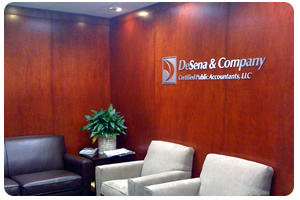 DeSena & Co. CPAs started in 1976. Today the firm has grown to a progressive and diverse accounting firm. Our philosophy is "to provide knowledge and expertise together with an unsurpassed level of dedication and personal attention".